Quick post due to a very, very busy week. Last day of The Angel Brigade exhibit so I do pray that you all still drop by the Rockwell Powerplant Mall to take a look at the photos and installation and of course, the fund-raising silent auction. While you’re at it, satisfy your sweet tooth by getting a marshmallow cake from Costa Brava (there are dessert stalls in the basement of the mall the whole day). Maybe yours will too, but don’t overdo it. 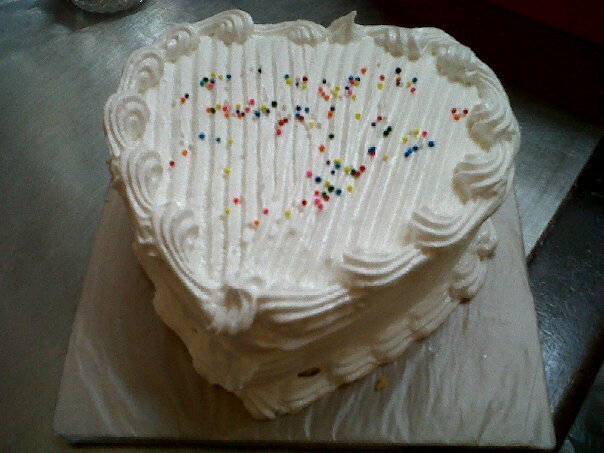 This heart shaped marshmallow cake costs about 160 pesos, there’s a bigger size in a rectangular shape and you can also get the same soft, moist marshmallow plus loads of butter combination in cupcake and mini-cupcake form. Costa Brava claims they make their desserts with no preservatives and no artificial ingredients. Well, that’s what they say, not sure how marshmallow fits into that mix, but I still enjoyed this cake all the same. Thanks to my good friend Luis Espiritu for turning me on to this rather sinfully delightful sweetiepie!